Vacheron Constantin is one of the oldest watchmaking companies in the world. They specialize in fine movements and precision combined with rich designs, and their new line for the Salon International de la Haute Horlogerie (SIHH) is no different in terms of keeping with the classics. But there is a something new about this line which has surprised many: the entire line is comprised of women’s watches. While a line consisting entirely of women’s watches is a bold move, it is somewhat less surprising when you consider Vacheron Constantin’s history. Vacheron Constantin has always seen the necessity of creating timepieces for women. In 1810, the company began to produce timepieces for women celebrating their high status. Throughout history they have continued to support strong women with their beautiful timepieces. And with this new line, Vacheron Constantin hopes to continue to celebrate the beauty and strength of women. The new line is described by Vacheron Constantin as “an interpretation of time from a feminine perspective”, and consists of three new models in separate collections. These collections have officially been named the Patrimony Contemporaine Lady, Malte Lady, and Métiers d’Art Florilége. The last of these three pieces is stunning, and immediately became the centerpiece of this new line. The Métiers d’Art Florilége collection was inspired by “The Temple of Flora” by Robert J. Thornton, a book of botanical illustrations. Three illustrations from the book were chosen and then used in the designs of each watch dial. Several different techniques were used to recreate these images, including guillochage, enamelling, and gemsetting. The dial of each piece is hand-crafted to ensure that each piece is of the highest standards. The Métiers d’Art Florilége collection employs the use of the Calibre 4400, which was developed and crafted in house by Vacheron Constantin. This 127 piece calibre contains 21 rubies and functions at a frequency of 4Hz, or 28,800 vibrations per hour. Timepieces in this collection are manual-winding, and has a power reserve of 65 hours. To learn more about Vacheron Constantin’s SIHH 2013 collection, visitwww.vacheron-constantin.com/en. Diamonds that dazzle and a snow white ceramic bezel display a crisp and cool personality, showing Tag Heuer hasn’t forgotten the ladies this year. Tag Heuer’s Formula 1 Steel and ceramic diamond bezel is a beauty that Maria Sharapova calls her favorite watch. On top of being an amazing athlete, she is an ambassador for Tag Heuer. She is regularly seen out sporting her own Formula 1 watch. The beauty of this watch is that it is sporty and fun. It’s not overly embellished with diamonds or ornate décor; it’s an everyday watch that has true functionality. The ceramic bezel displays the seconds’ counter, while the interior of the dial has a date window at the three o’clock position, the traditional TAG logo at the twelve o’clock position, and the Formula 1 stamp at the six o’clock position. Another nice feature that shows this watch is more than just a pretty face is the hands and indexes are luminescent. This makes the watch easy to read, day or night. The bracelet is polished steel with the inner links being white ceramic. It has a butterfly folding clasp which is very user friendly. This is a beautiful watch created by Swiss watchmakers in the heart of Geneva. The design aspect is functional and beautiful. The watch is easy to read at any time. The white ceramic is very popular and great for any outfit. Diamonds accent the bezel, though it won’t prove too flashy for everyday use. Maria Sharapova wears this watch regularly. The bracelet is comfortable on your wrist. As long as the crown on the watch is screwed down, this is a watch you can go swimming in without worrying. Above all, it’s a great watch with a modest price. The size of the watch maybe be too large for some wrists. The diamonds are beautiful, but some women do not want diamonds on their everyday watch. It depends on the type of lifestyle you live and what you want out of your watch. The Tag Heuer ladies Formula 1 watch is a great watch for ladies with an active lifestyle that want a little bit of diamonds in their daily wardrobe. It is functional and fashionable combining the best of both worlds for women on the go. The new TAG Heuer LINK ladies automatic watch is the epitome of elegance. Its design attracts women with all budgets. The watch itself has over three-quarter carats of diamonds, and not just any diamonds, it has top quality diamonds. They clarity ranges from VVS-VS quality. There is no guarantee of what the mother of pearl on each dial will look like, but white mother of pearl complements practically every wardrobe and skin tone. It’s a youthful and timeless touch to add to any timepiece. The mother of pearl does not distract from being able to read time either. The diamond markers make it easy to see the time, and you look fabulous while doing it. The 34.5 mm case diameter is a universal size, which looks great on practically anyone’s wrist. It is also water resistant up to 100 meters. Now, you can look amazing and wear a completely functional piece of jewelry at the same time. Since mother of pearl is a natural gemstone, each mother of pearl looks different. The watch is an automatic movement. This means if you do not wear it, it will not keep time unless you put it on a watch winder. Over time the bracelet gets scratched up, but when you send it in for servicing, it will come back nicely polished. –Do not leave the watch siting for long periods of time without wearing it. The automatic movement needs to stay lubricated. Just like a car that sits in the garage for a long time stalls before starting and parts get worn out, your watch is the same. The movement needs to be oiled by wearing or winding it. If you don’t, the seals break down over time, and the movement dries out. -Make sure the watch fits on your wrist properly. If it doesn’t, then it will not be able to keep accurate time. Automatic movements are powered by the movement of your wrist. If you watch circles around on your wrist, then the movement is not getting the power it needs to keep the watch wound. It will lose time if it is not sized correctly. The TAG Heuer LINK Ladies automatic watch is a beautiful watch, and it makes for a great every day, functional piece of jewelry. It has excellent diamonds and a beautiful mother of pearl dial. The diamond quality alone makes it a great catch at $7,200. I would recommend this watch to anyone that wants to celebrate life or a special occasion with something that can be worn with jeans and a t-shirt or an elegant dress. 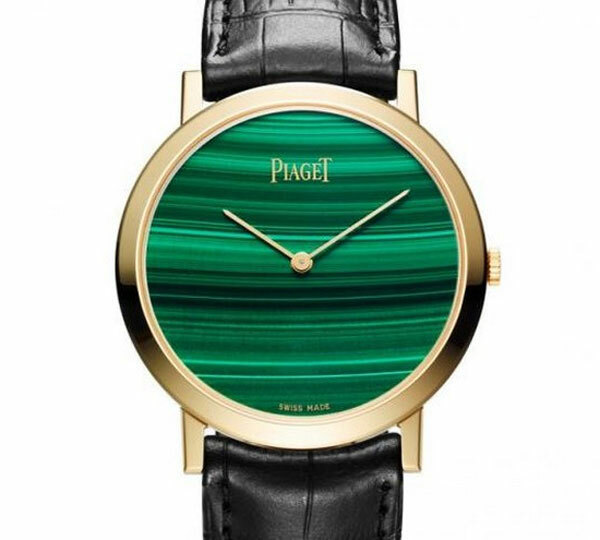 If you’re tired of wearing a timepiece with a classic mother-of-pearl or plain looking dial, Piaget just might have just the watch for you. 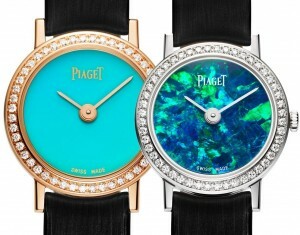 Piaget has created a brand new collection of unisex watches bearing brightly colored stone dials that will add a serious splash of color to any look. 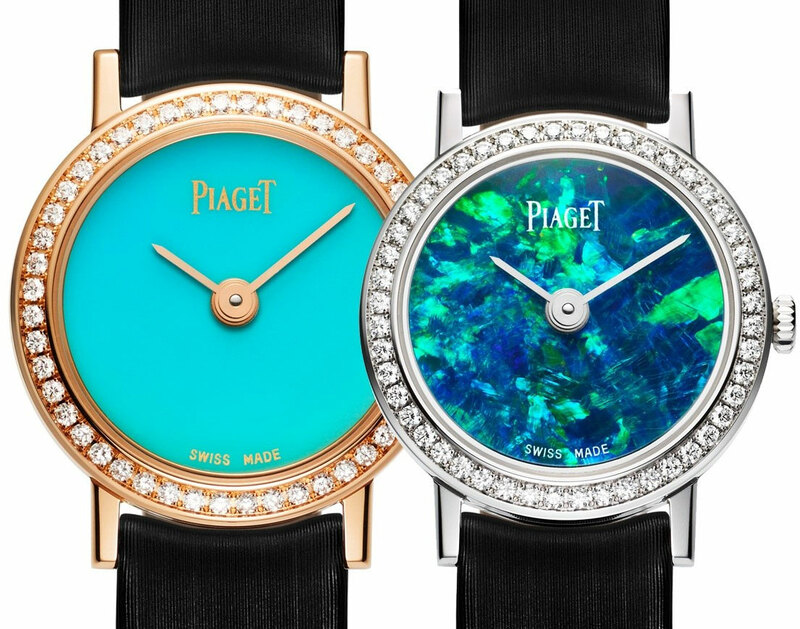 This new collection of stone dials watches is aptly called the Piaget Altiplano Hard Stone Dials Collection comes in three different sizes and comes equipped with the Caliber 430p or Caliber 690p manual winder. There are six different stone dials with each of the different dials representing different character strengths. The Turquoise stone represents good Luck and protection, Lapis lazuli represents harmony between partners, Malachite represents hope and inner peace, Heart Ruby signifies warm, beauty and wisdom, Jade implies beauty, goodness and preciousness and the Opal represents healing. Wearers can enjoy choosing their favorite colored stone dial or pick a watch based on the type of strength you would like to attract in their life. Aside from all the character qualities that the timepieces can impart to the wearer, each timepiece comes fashioned with a bezel encrusted with gems with many of the watches featuring diamonds or polished yellow, white or pink gold. Another unique feature of the Piaget Altiplano Hard Stone Dials Collection which Piaget has long been recognized for is their ultra-thin dials which measure less than 3 millimeters thick. The ultra-thin watch looks especially striking next to the case of the unisex watch which measures 34 millimeters. Each watch has a mechanical, hand-wound movement, balance stop, hours and minutes functions, approximately 43 hours power reserve and pulsates at 21,600 vibrations per hour. Each Piaget Altiplano Hard Stone watch is numbered, produced individually and sold solely at Piaget boutiques. While most women will appreciate the colorful stone dials, diamond accents and positive energies that each of the timepieces bring to the wearer, it would seem that these bold and vibrant watches, although unisex, might be a hard sell for males who prefer a more classic look. Unisex watches often seem difficult to design as they must appeal to both the masculine and feminine wiles which can be quite a delicate balance to achieve. If you happen to be looking for a special timepiece that beholds special energies and a unique stone, the Piaget Altiplano Hard Stone Dials is an ideal timepiece to add to your collection or give as a gift to someone who would appreciate the delicate and unique characteristics of this timepiece.